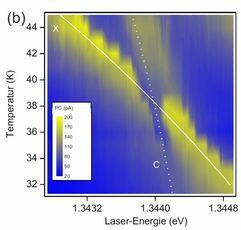 Temperature resonance tuning of a quantum-dot micropillar under optical excitation and electrical read-out. The project comprises experimental and theoretical investigations to gain insight into the non-linear and non-markovian dynamics of excitons and biexcitons in quantum dots. Systems with and without microresonators will be analyzed. Applying photocurrent spectroscopy and an advanced path-integral method we aim at a comprehensive study of the coherent dynamics of excitonic complexes confined in single self-assembled quantum dots. The studies comprise also investigations on the coherent evolution of coupled quantum dot – microcavity systems via electrical readout.